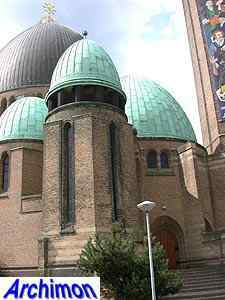 At the end of the 19th century Waalwijk's catholic church had become much too small for the parish. Also, the roof needed repairing. 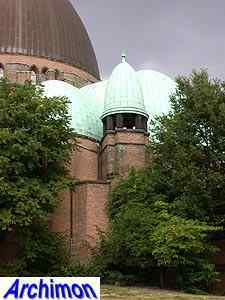 Despite the lack of sufficient funds, the parish commissioned Jan Stuyt to make a plan for the enlargement of the church. In 1908 Stuyt showed his plans. It must have been a typical design with four towers. But the construction of it was postponed, still because of financial reasons. The financial situation did not improve until 1920. From that year on the government started to subsidize special education (i.e catholic, protestant and jewish schools), which meant that the parish no longer needed to pay the teachers salaries. 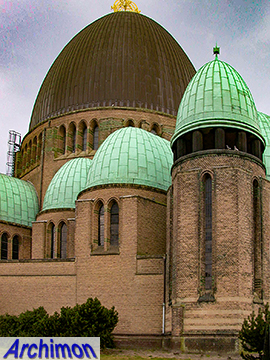 In 1922 the final decision was made to build a new church. Strangely, the then relatively unknown H.W. Valk was commissioned instead of Stuyt. It is well possible that Stuyt, who had more than enough work already, suggested to hire this former employee of his instead. 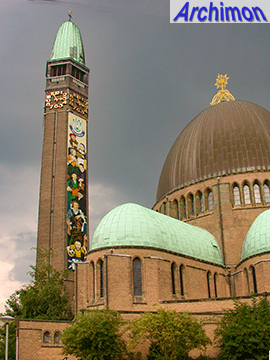 It was Valk's largest assignment ever, and with its 19 parabola-shaped copperplated domes and hexagonal minaret-like tower this is one of the most exotic looking churches in The Netherlands. It is definitely the largest dome-church in the country. 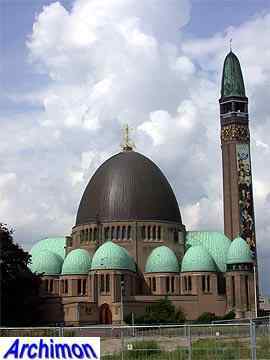 Originally the plan was to build an even larger church, which could contain 1200 people. 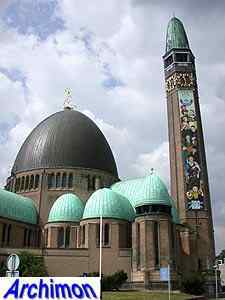 For budgetary reasons it was decided to build a slightly smaller church, for 1000 people. 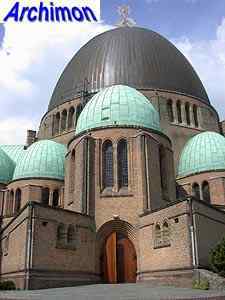 The largest dome is on the actual church-space; the other domes are on chapels which are arranged radially around the central space. Light inside the church is provided by the windows, which are all at a relatively high position. This way light can only enter the building from above, to create a sacred atmosphere. Originally plates of yellow Solnhofener stone in the floor reflected the light. In the 1960's these were replaced by black tiles, totally ruining this effect. 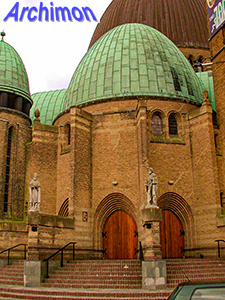 Despite the fact that this church was built early in his career, especially a closer look inside reveals what a talented architect Valk at that time already was. For the construction of the entire building brick was used. 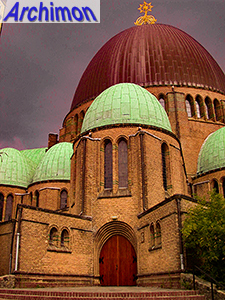 Only for the large central dome an iron skeleton was used for strength, around which the bricks were laid. This skeleton was built on top of a reinforced concrete ring. 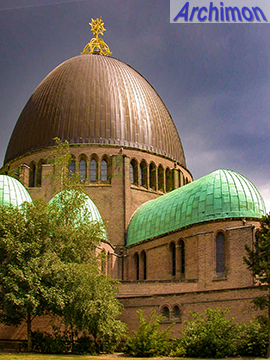 To cover the outsides of the domes and the spire, 20.000 kg of copper plates were used. The entrance to the tower is decorated with a portal in Flemish baroque style that dates from 1630 and originally belonged to a house in Breda. It was taken from the neo-Classical church that used to stand at this location previously. 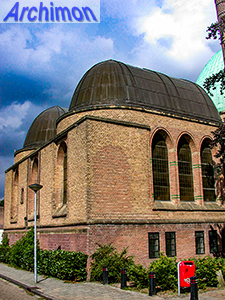 The church is often filed under neo-Byzantine architecture, but is in fact a true example of Expressionism, similar in many ways to the Amsterdam School. 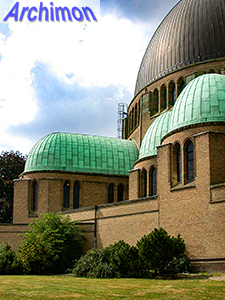 Outside Catholic circles the design was criticized for being 'too traditional'. Stuyt advised Valk not to care about the comments in the press with the argument that the non-catholic architecture magazines were only interested in 'Social Democratic architecture' in the first place. Which, ironically, would have been the Amsterdam School, one of Valk's major influences of that time. 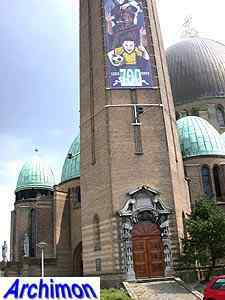 The pictures on this page were made in 2003, when Waalwijk celebrated its 700th year as a town. For this occassion banners were attached to the tower.